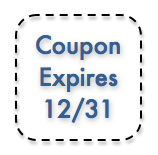 I checked the Southern Savers Coupon Database and there are 1,854 coupons set to expire this Sunday 12/31. If you’ve been hanging onto high value ones, now is the time to use them. While that might make your head spin, I have some good news for you! We always see tons of new printable coupons on the first of the month, and this time it also falls on a Sunday when there will be lots of inserts in the newspaper (look for the full list at 5 pm today)! I’m gearing up to make 2012 a huge year of savings and I hope you are too!